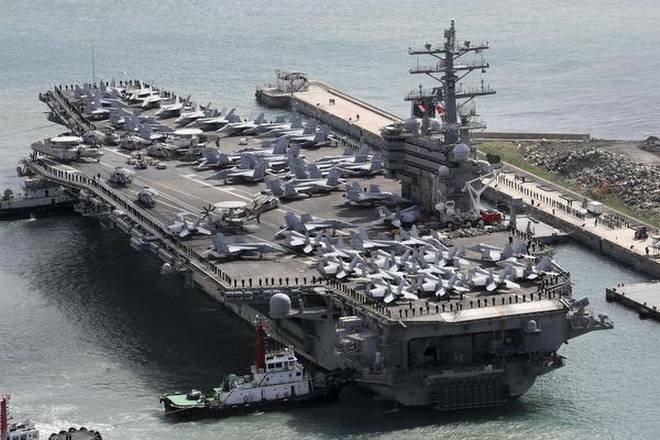 The aircraft carrier USS Ronald Reagan (CVN 76) is escorted into Busan port, South Korea, after completing a joint drill with the South Korean military, on Saturday. US naval commanders on Saturday reiterated Washington’s “ironclad” commitment to defend South Korea against North Korean threats as an American nuclear-powered aircraft carrier visited a South Korean port following a joint naval drill. Rear Adm. Brad Cooper, commander of Naval Forces Korea, said aboard the USS Ronald Reagan that the drills enhanced the allies’ ability to coordinate operations. The five-day drills that ended Friday involved fighter jets, helicopters and 40 naval ships and submarines from the two countries training for potential North Korean aggression. In an apparent show of force against North Korea, the United States also sent several of its advanced warplanes, including four F-22 and F-35 fighter jets and two B-1B long-range bombers, for an air show and exhibition in Seoul that began on Tuesday. The drills came ahead of President Donald Trump’s first official visit to Asia next month that’s likely to be overshadowed by tensions with North Korea. The United States has been sending its strategic assets to the region more frequently for patrols or drills amid increased efforts by North Korea to expand its nuclear weapons program. In recent months, North Korea has tested developmental intercontinental ballistic missiles that could potentially reach the US mainland and conducted its most powerful nuclear test to date. It also flew two powerful new midrange missiles over Japan between threats to fire the same weapons toward Guam, a U.S. Pacific territory and military hub.